As many of you know by now, we try to eat a fully vegetarian meal at least once a week; more often, we manage to get in 2-3 vegetarian or at least “quasi-veg” dinners. (By “quasi-veg,” I mean meals that are without a sort of main animal protein on the plate, but which might use chicken stock, a small amount of bacon, or something like that for cooking and flavoring the other elements of the meal.) The great things about going veggie or quasi-veg are that we can often eat very affordably this way; it’s almost certainly healthy, as long as we don’t choose to just drown everything in cheese or cream; and it’s nearly always quick. Perfect midweek fare. The downsides are that it can be hard to come up with vegetarian fare that satisfies the whole family, and at this time of year — with fresh, local produce still in short supply — I’m usually getting to the end of my rope as far as inspiration goes. Give me market stalls full of freshly picked produce in dewy jewel tones, pulled from the fields just before journeying over to our little farmer’s market venue, and I’ll think of a dozen ways to cook it all. Set me down in front of the same old roots, tubers, and dark greens that have defined our diets since late fall, and I start to lose momentum. Tonight’s dinner, though, is one of my favorite ways to go veggie at this time of the year (or any time, for that matter — but you get my point). I found the recipe somewhere online ages ago; I’m terrible at writing down where I get things from, especially since I usually just hastily scribble some shorthand notes that pass for something resembling a recipe before taking the thing home and cooking it up my way. This one in particular seemed so deceptively simple that I didn’t bother to take any kind of detailed notes at all and just scrawled some ingredients, many of which I’ve tweaked, replaced, or done away with altogether over time for the sake of pleasing our palates or making the dish either faster or more affordable to construct. The end result is a whole-wheat spaghetti dish, tossed with just a little bit of goat cheese for punch, and a big skillet full of sauteed shredded sweet potatoes, sliced red bell peppers, and garlic. The sauce is made from white wine or a splash of vinegar or lemon juice, tarragon, and the starchy water used to cook the pasta. We usually throw a little Parmesan on top of ours for the extra salty note, and that’s it. You don’t need much else besides a salad to make a simple weeknight supper. Kid success rating: 3 out of 5 possible tomatoes. 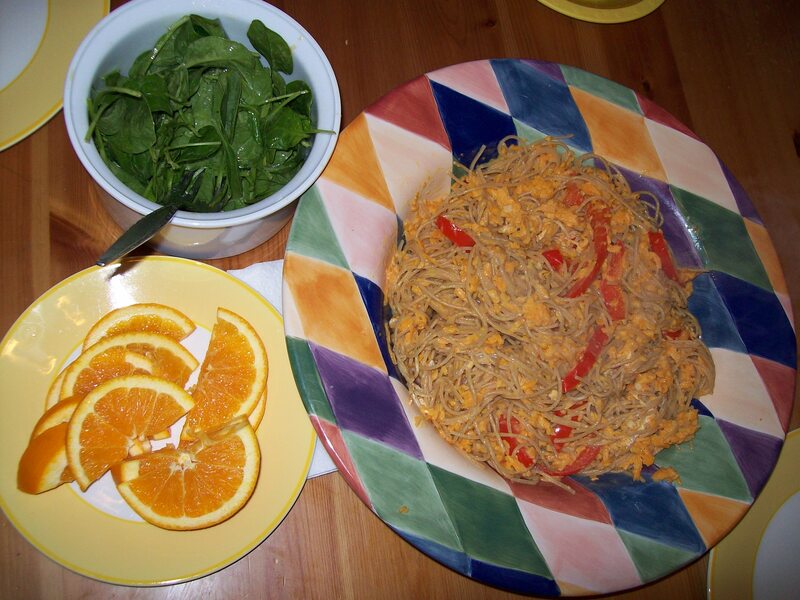 L. ate the oranges and two helpings of the spinach salad with no problem, but needed some extra encouragement to try the pasta. He did eat some, though, along with the red peppers that were on his plate. P. ate a small portion of oranges and spinach salad and — as I expected he would — firmly refused to try the pasta. We’ve only just gotten him to eat even a few small bites of any type of pasta in the past week or two; he’s never in his life gotten more than maybe 5 or 6 bites down. Plus, we think he’s cutting molars, so he’s fickle at the table. Cost rating: 5 out of 5. Let’s face it; other than a tiny log of goat cheese, this is a downright cheap meal to make. And since there’s no meat in it, spending $4 on some cheese still brings it way under the budget we’d ordinarily allocate for a supper that includes high-quality animal protein. Time to table number: 25 minutes. Plunk a pot of water on to boil, shred and slice a few veggies, throw a bunch of stuff in a skillet, and dinner practically makes itself. This is one of those dinners that makes me wonder why anybody would say it’s too hard or too time-consuming to eat a healthy family meal; we got a satisfying and super-nutritious spread of food on the table in less time than it takes the delivery guy to bring pizza to our door. Three dinners so far in my “week in pictures,” and just over an hour’s worth of time, total, to make them all. Have I convinced you yet that family dinner is possible? This entry was posted in Accountability, Cooking, Feeding kids, Meal planning, Parenting and tagged cooking, family, feeding kids, food, Household organization, kids' health, meal planning, parenting, veggies. Bookmark the permalink. I would have never thought of sweet potatoes in pasta…thanks for the idea! No problem! I thought it was weird at first too, but so intriguing that I had to give it a shot.